Studio 30 offers various opportunities for local artists to develop their knowledge and skill in art. We offer insightful meetings for our members where they can learn different skills from talented artists from Victoria. We also enjoy interacting with each other and creating an inclusive community where artists can communicate and deepen their passion for art. 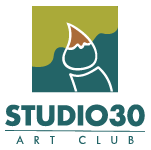 Studio 30 welcomes artists of all backgrounds who share the same love for art. Feel free to visit us at any of our upcoming events and meetings to learn more! Yes, most of our artists’ works are for sale. If you would like to connect with an artist, email ssarens@shaw.ca and we will make that connection. Also, Studio 30 has an art exhibit and sale at Tillicum Centre from April 29 to May 5, so stop in and see us.